The CNT made for an amazing and very approapriate venue for an event celebrating electric vehicle releases. 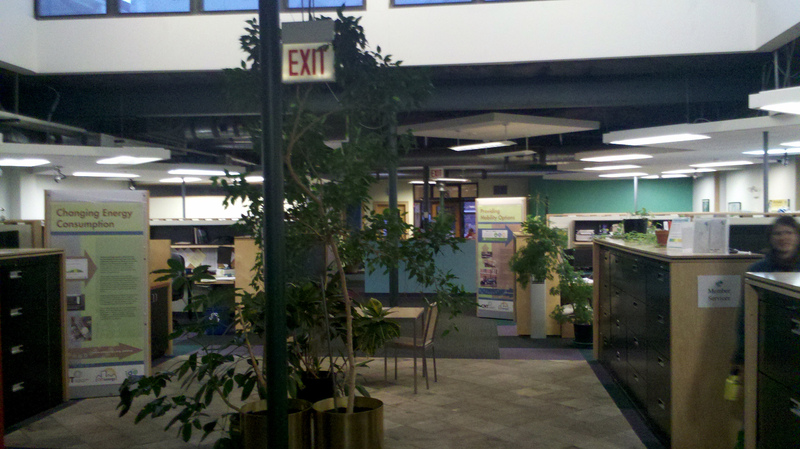 As the home for IGO, the office is a LEED Platinum rated building that, in fact, is Energy Star certified as well. An array of materials coat the interior and make for an amazing space to explore. Various parts of the ceilings are exposed, clerestory windows bring light into the space, and material color/texture make for a comfortable yet exciting workspace. If you have not yet seen this place (it was my first time), I highly recommend going! IGO to date has 1 Nissan Leaf and 2 Mitsubishi i-MiEVs. The two cars are very different in style but are both great electric vehicles. The i-MiEV is much shorter, slightly taller, and much more simplified than its Leaf competitor. The Leaf, in contrast, is a bit closer to a standard car in terms of its feel, has a better electric “hum” sound, and is a little more comfortable than thet i-MiEV. Again, they are both great cars! I highly suggest checking them out online and keeping an eye out for our EV comparison blog post coming up in the near future. Something unique about EV cars…while we were riding in the Leaf, we drove on some alleys that were made with old brick pavers. The cars have quite motors instead of their louder gasoline engine counterparts, so while driving, we were able to hear the rubble of the wheels on the brick pavers more predominately than the standard engine. It was a really cool and unique experience, and we realized that, while this sounds like a little thing, electric vehicles could really change how we experience driving and the driving conditions around us. Neat! Like I said above, IGO currently has 3 EVs. However, they plan on having 16 (yes, 16!) EVs by the end of the summer. Very exciting! They will be splitting those 16 vehicles between the Leaf and i-MiEV and will be spread throughout the city. Of course, we can not talk about electric vehicles without considering the obvious…how will we charge these things?! Don’t worry, IGO has that figured out. They are in the midst of ChargePoint charging station installations throughout their future locations, and coupled with Chicagoland initiatives of installing charging ports at neighborhood grocery stores, Walgreens locations, and even some highway rest areas, you are sure to have a supply of locations for charging the vehicle. However, IGO has even gone a step further. Lowering the need for gasoline is great, but not when you’re making the trade-off to burning coal and other electricity-producing fuels. So, IGO is also in the midst of planning/building Solar Charging Canopies at their EV locations, which will charge their electric fleet on renewable, clean solar energy. Plus, the canopies will be tied to the grid, which allows excess energy to be sent back into the grid to be used by the electric companies in Chicago. Now we’re talkin’! Overall, it was an awesome event! It really brought out the excitement of supporting companies that have great, forward thinking ideas that support communities and look beyond the bottom line. If you are considering an car sharing program and are only concerned about needing it in Chicago, I highly recommend looking into them, and keeping an eye out for more electric vehicles on the road with the IGO logo!